Welcome back! We hope that everyone had a great summer (or winter if you headed south), and are all ready and raring for a bit of rugby and touch which starts this weekend! But first the house keeping. 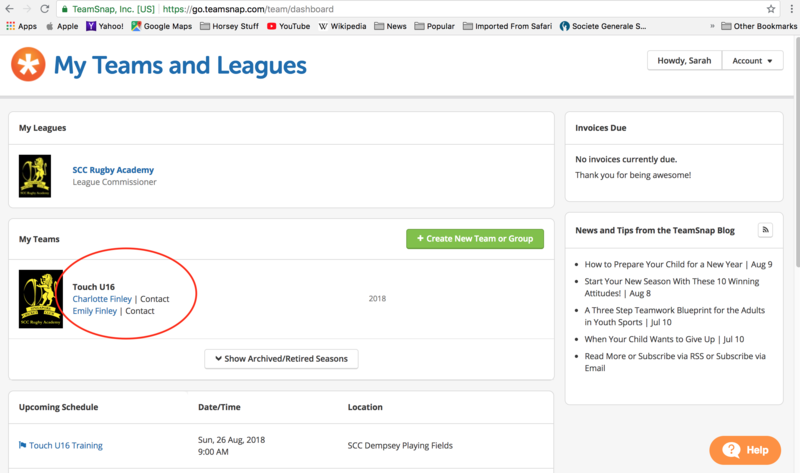 If you have left Singapore, or your child is just taking a break from the Academy this term, please don’t forget to drop a note to Sarah at info@sccrugbyacademy.com so we can update TeamSnap and the team lists. Training fees for Term 3 are now due. To check how much you owe for your child, select their team under My Teams on the dashboard page, and then the Payments tab to see their listing. 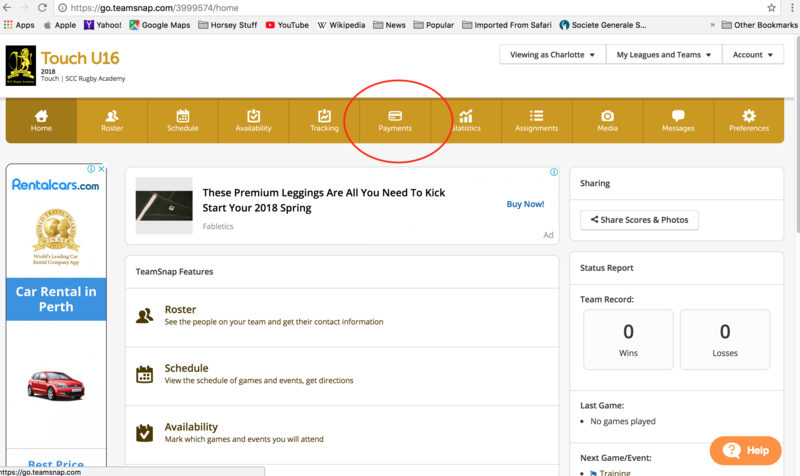 Please note that on your TeamSnap “home page”, it will show that you have no fees due for “Registration” – you paid this when your child first joined the Academy. You need to select your child’s Team home page, and then the Payments tab, to find this term’s Training Fees. A 10% charge will be added to all unpaid fees after the 4th week of term – for this term, the late fee will come into effect on Friday 21st September 2018. We accept PayPal through the TeamSnap. 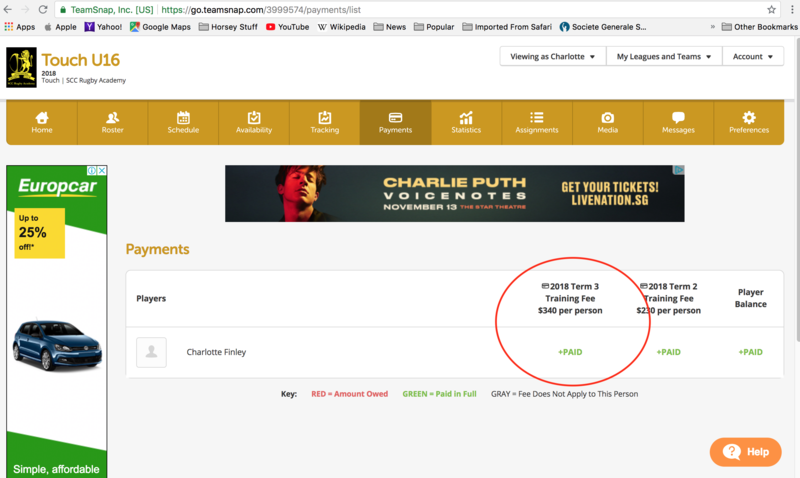 Just go to the Payments tab on your child’s team’s profile, and you will find the fee amount due and a link for PayPal if you would like to use this service. Please note that the PayPal link can only be found in the web version of TeamSnap, and does not show on the app version. Please reference your child’s name and age group on the payment. We do not accept payment of training fees by cheque or cash. If you order your ball before Sunday midnight, it will be available for pick up the following Saturday at Dempsey (during term time). This term we would like to try out something new and we are looking for one or two player representatives from each age group (U13 and above) to become Social Media Reps. This would mean regularly posting on the SCC Rugby Instagram account with news of your team, some great photos and stuff about the Academy. The Instagram account is currently run by coaches Bryan and Harresh and is a joint SCC Rugby section and an Academy account. We feel sharing an account also means that as players move up age groups they can see the progression into adult rugby and news of what the adults teams are up to. The other reason for looking for Social Media Reps is to create an online community and grow news about our Academy to others. We pride ourselves on having a great mix of local and expat players, and we are always looking to attract the best talent and most enthusiastic players to try our club. We hope that by having Social Media Reps you will help the Academy to reach out to people that might not naturally search for us on Facebook or for our website. If you think this is something your child would like to be involved in then please get in touch by dropping an email to info@sccrugbyacademy.com with your name and age group. THE U9 LIONESSES DID IT!! The Lionesses (U9s Mums) ran in the Shape 2018 Run to raise money for the Cararoo Foundation on Sunday 12th August. Six Mums (and One Sister) started at 7.30am for a 10k run with a goal to raise S$1000. The mums have decided to donate all money to the Cararoo Foundation, which funds the education and activities of less advantaged children in Manila. Max Nix’s mum, Rachel, is looking forward to delivering the outstanding news to Arlene at Cararoo Foundation that the Six Mums, and One Sister, along with our Rugby community, managed to raise $2560! This was significantly over what was expected. If you think you will probably move to the UK at some point, it is worth getting a sense of the tax and financial issues involved. In the midst of packing, address changes, leaving parties and general arrangements, it is easy to overlook sensible financial planning and there is potentially a lot of tax to be saved. Find out how you can plan ahead at this workshop. Light refreshments will be served and there will be an opportunity for Q&A during these informal sessions. Please make sure you check our Facebook page for the status of training if there is heavy rain, and/or thunder and lightning. You do not need to be signed up to Facebook to view this page as our page is public and open to all. This entry was posted in News and tagged Academy, Newsletter, Rugby, SCC.